Re: super detail "train set" on a super budget? how hard are traversers to build? I've never actually properly looked into it because I was never sure I'd be able to fit one? Not to difficult at all, once you get the assembly in the right order. Ultra critical measurements can usually be avoided (although some revel in them). You know about the story of the perfect archer? His trick was to paint in the target around the arrow wherever it hit. One option for a traverser the size needed here would be a pair of second-hand slide rules. Smooth and precise. 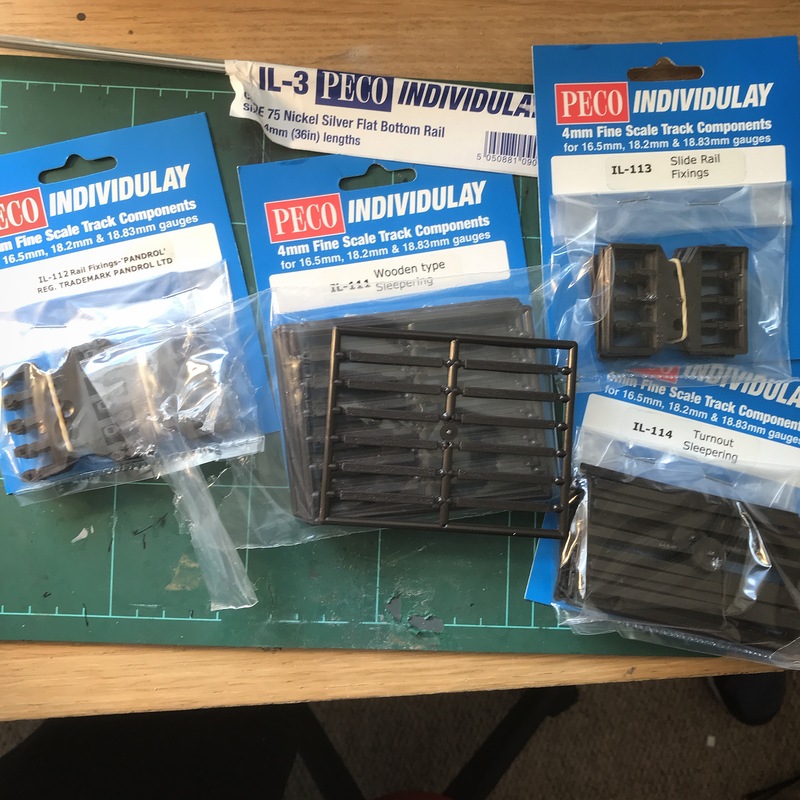 going to have a go at building some track and points with these parts, will post my results! another idea I've had, maybe a potential "challenge" thread in here, would be to build a layout (of any kind) with 2 goals, costs low as possible and no RTR objects, the challenge being to push everyones abilities (its more something i wanna do but it feels better if other people do it too so its kind of a shared experience and also helps with the learning) this idea falls down a bit when it comes to steam locos, because I cannot find a way to build one with out the costs pushing it close or above the price of an RTR equivalent, the costs mostly coming from wheelsets and motors + parts, anyone have ideas on how to reduce those costs? Michaelaface wrote: because I cannot find a way to build one with out the costs pushing it close or above the price of an RTR equivalent, the costs mostly coming from wheelsets and motors + parts, anyone have ideas on how to reduce those costs? The motor and chassis block (substantially cut down) is from a Hornby 0-4-0 which can be picked up very cheaply, especially if the bodies are broken, which of course doesn't matter. The wheels were a bit of luck in that I had them all already in a box kept "just in case" but depending on size you can pick up some relatively cheaply if you rifle through bits boxes at exhibitions or look out for Hornby spares - I agree buying direct from Alan Gibson, Markits or Romfords is expensive. The wheelsets for the tender I found in a stand at the steam gala for £1. The buffers were a couple of £ but other than that everything is plasticard, various sizes of wire or miliput. Even if buying the wheels instead of finding them, I shouldn't think this should come to more than £40, much nicer than many equivalent RTR locos of this size you could buy second hand. Regarding scratchbuilding. 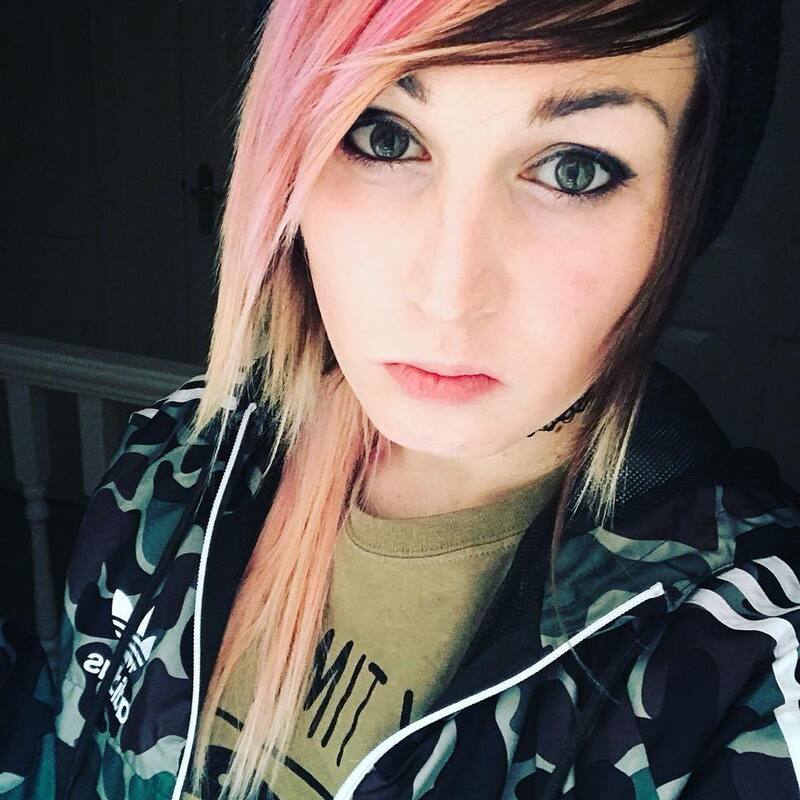 Here is what I did. I started with building a Smallbrook Studio 7mm narrow gauge kit and didnt have any stock to run with it. I just wanted cheap and cheerful. I gathered together the scrappy 00 gauge wagons and bits and pieces that I'd accumulated over the years and thought "Why not. I've nothing to lose!" and went from there. When I could afford a kit I'd buy one,but most of my efforts were to use up what I had going spare. Something else helped me and this came in the form of freelanceing. Why keep to a prototype? Why not make your own little railway? No one can look at something you've made and say "That's not right" as how do they know? As long as your locomotive has the basic components (E.g., a steam locomotive needs water storage and if a longer distance loco, it needs fuel storage (E.g. coal or wood or oil etc, and a diesel loco has an engine with a radiator, and a fuel tank etc... ). I think if you go down the freelance route it is very liberating as it gets you thinking how real locomotives and stock are made and why they are made that way. In a way you can learn more through a freelance model, then if you'd copied a prototype. My origional plan to go into 7mm narrow gauge as a sideline to 00 gauge has changed. Now my efforts are with 7mm narrow gauge, and my 00 gauge is stored away! I didnt see that one coming. I had a look at that. Its nice. Regarding wheels. All depends what one hopes to make. The standard 0-4-0 Hornby wheels may not look brill, but they do work well and that's why I like them. For the price you can't go wrong with the 0-4-0's as they can be brought to run nicely if one pays careful attention to the wheels and pickups. You will find, that if you buy a Smallbrook kit that has external cylinders as part of the footplate moulding, that you can combine a modern Hornby 0-4-0 Smokey Joe or GWR type chassis onto a later Triang metal frame. There will be a lot of work cutting the frame weight and drilling (Milling/grinding!) a hole or two through the mazak material of the weights so you can mount the chassis to the body, and there will also be a bit of work to remove material from the resin body kit to make the motor work with the new chassis assembly, but once completed with new pickups made, it is such a rigid free running chassis that it is worth the many evenings of graft to get it to work. It is not a quick conversion by any means. It took me two evenings to drill holes to mount the body to the chassis, and cut the chassis weight down. This loco has had this done to it. If anything, it is a bit too heavy as it just doesn't wheelspin even when it pulled a rake of ten 00 gauge coaches. Why I'm going to look for brass gears for it in case it shreads its nylon gears. It hasn't done so as yet, though I want to make sure! 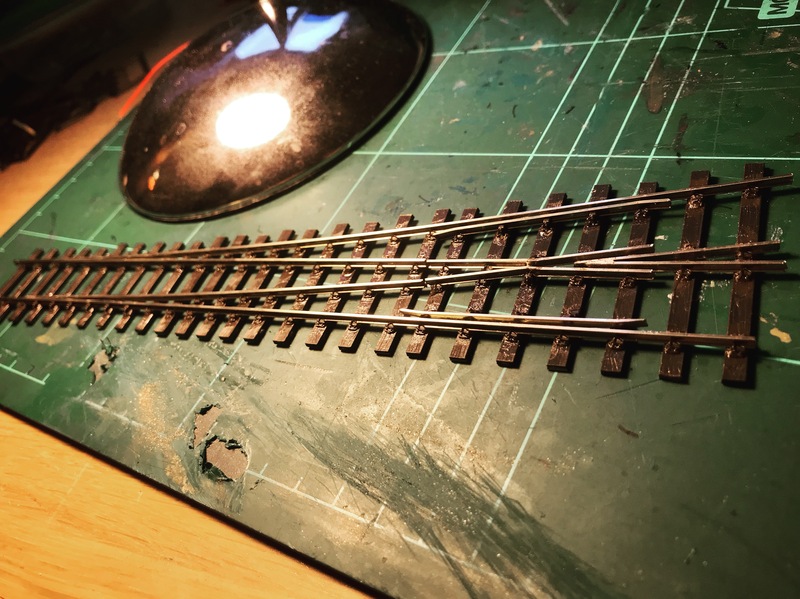 also made loads of progress regarding the track, so I bought some of that peco individulay to see what it'd be like to use and how it would compare to the copperclad method, and after a few hours work I have created this! I'm very pleased with how this turned out considering this is my first attempt at building a point using plastic components, I'd say, although it requires a more complex construction than simply soldering rails to pcb strips, building using plastic parts was actually easier, and obviously it looks a million times better, I highly recommend giving this a go if you're interested in building your own track! I do have a reason for making my own points with PCB sleepers. 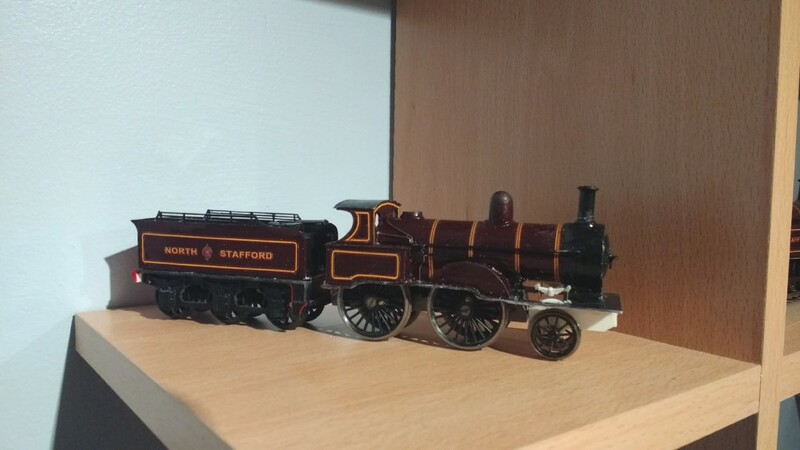 It is not that I dont have 00 gauge points, but it is more that I can make points which cost me less then £1 in materials. (It will probably be more like 50p). It was the cost of new track when I didnt have the funds which had me make my own, as I did have a lot of 00 gauge track which I could use. And this is what I did. [What I've not said about making my own points, is that though it is cheap, it is time consuming, usually a good few hours work per point]. The point you've made is impressive. It looks like code 75. I've never tried Peco Individualay. What do you get in a pack? Is interesting stuff. Normally there will be a lot of waste spruces. They are actually recyclable depending on the type of plastic used. Making a difference to the Hornby 0-4-0 would be so much easier if Mr Ultrascale would release his Triang motor bogie gear and worm as an item, or just tell us where he gets the nylatron worm there's a Hornby gear that meshes with them. I have the pair working in one of my 0-4-0s. Regarding relacing the gears in a hornby 0-4-0, would this change the gearing? It seems to me they run fairly well but their high gearing gives only 'fast' or 'faster' as speeds... at slower speeds the motor is on such little power it struggles. It depends on which version as the newer ones dont have the high top speed even though they look identical to others. I'm not sure if it was tackled on the gearing side of things or restricting the motors voltage? Not sure. They work well though. I was thinking along the lines of using brass gears as the bodies of my locos have added weight which may put extra strain on the gears over time. I want the extra weight but I also want to eliminate the weak areas.